As an introvert (as well as an empath and highly sensitive person), my daily self-care practices have become a non-negotiable part of my life - I’ve had to learn this the hard way. 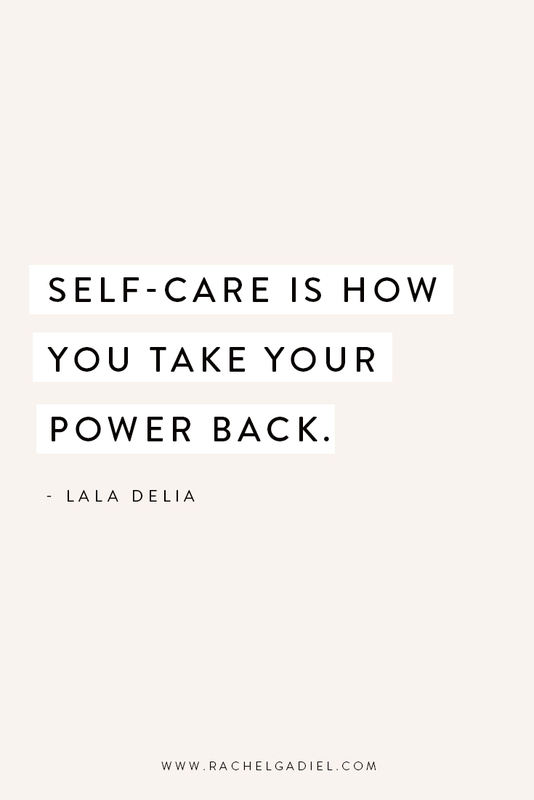 I know when I invest in my own daily self-care it helps me feel calm, balanced and grounded and I’m ready to take on each day and show up as my best self. Introverts thrive when we give ourselves the time to fuel our energy and the space we need to decompress from our day. Knowing this is incredibly empowering and it’s our responsibility to intentionally carve out our days in a way that feels nourishing and supportive. When we feel depleted, it’s a sign we haven’t created the boundaries we need to take care of ourselves and protect our sacred energy. Today, I‘m sharing 7 daily self-care practices that are integral to my well-being and happiness that I hope inspire you to begin cultivating your own daily practice, so you can start feeling good every single day and step into the most joyful, radiant and aligned version of you! Start your day feeling good! This begins the minute you wake up. Instead of reaching for your phone, focus your energy on how you want to show up in your day. Who do I need to become in order to show up as this next level version of myself? Take a few minutes to visualize and get into alignment with the version of you who already is the confident, radiant and soulful woman that you already are. How can you embody her qualities and start taking aligned action as soon as you get out of bed and embark on your day? Meditation is an opportunity for us to turn inwards and develop our intuition. The more we practice quieting our mind and feeling into our bodies, the more we’re able to pay attention to the subtle nudges we receive from our inner wisdom. As introverts, we spend a lot of time in our head and we internalize everything. So much, that we can actually end up becoming completely disconnected from our bodies and unaware of the important messages it is trying to tell us! Meditation offers us an opportunity to create space in our mind; slow down the million and one thoughts we have and start reconnecting with our soul. Each morning, I get up before my husband and prepare myself a cup of green tea. While it’s cooling, I use the Insight Timer app and sit in silent meditation for 12-15 minutes. Closing my eyes, I turn my attention inward and focus on my breath. The goal is not to have any thoughts - but when they arise, choose not to follow them and instead return your focus to your breath over and over again. This is definitely a practice - which is why it’s often referred to as a meditation practice. The more we practice, the easier it becomes to identify the voice of our ego vs the wisdom from our soul. And the more we get attuned with this, we can start making better decisions and taking action in our life that is aligned with who we truly are. When our minds are anxious and filled to the brim with thoughts whirling around, one of the best ways to get back to calm is by emptying everything out of our mind and putting it down on paper. Journaling is a wonderful practice to help ease our worries, acting as a healing tool and encouraging us to look at things in a new light. It can also help us resolve decisions and release any worries or concerns weighing us down. Research has shown that keeping a daily journal can help reduce stress, strengthen our self-esteem and allow us to better handle life challenges thrown our way. Writing can also be a healing end to a stressful day and a wonderful way to clear our mind in anticipation of the new day to come. There is no right or wrong way to journal - you can either start by free-form writing everything that’s on your mind; or you can also use prompts to get you started. What am I worried/anxious about? What step can I take to help me feel grounded? Apart from the numerous physical benefits exercise provides, regularly moving our bodies has a significant positive impact on our mental health. Exercise helps to remove any stagnant energy in our body and boosts our circulation, activating the neurotransmitters in our brain that release serotonin and endorphins, which make us feel good! By committing to moving everyday, we can help ward off depression and reduce anxiety - both of which according to research, introverts can be particularly susceptible given we tend to internalize a lot of our emotions. Regular exercise provides relief by enabling us to release the negative energy from our body in a healthy and productive way, instead of holding on to it and letting it affect our mood and state of being. At the end of 2018, we moved out of the city in San Francisco to live closer to the water and be surrounded by nature - the change of pace and being by the water has been incredible; I finally feel like I can breathe again. Being in nature is something I crave and when I don’t spend enough time outside I start to feel anxious and my stress levels increase - have you felt this way too? Spending time in nature is extremely nourishing and calming for our nervous system, helping to reduce stress, clear our minds and fueling us with energy. As introverts, we are sensitive to our surroundings and not getting enough nature time can be particularly unsettling. If you live in a city, make it your mission find a park nearby you can escape to and if you can, take weekend adventures to go exploring so you can recharge. 6. 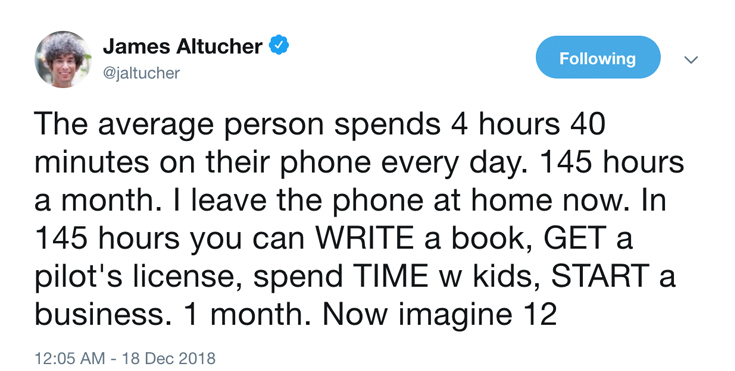 Unplug and disconnect from technology. Do you know who biggest competitor is to the Silicon Valley giants - Facebook, YouTube and Instagram? Nope, it’s not another brand or product - it’s our sleep. It’s really, really scary how much time we spend being attached to our phones and using technology. Whilst technology has afforded us many benefits, spending too much time online and in front of our screens has serious implications for our mental health and has been linked to increases rates of depression. I’m super guilty of this. I installed the app Moment on my phone to help track my usage and started becoming extremely mindful about how I engage with it. Not checking my phone first thing and not even looking at email or social media until after I’ve sat in meditation and come back from my morning walk. Keeping my phone in another room during the day. Even these small changes have had a dramatic impact on my mood and productivity. How can you integrate some small tweaks so you can focus on what is most important to you and spend more time on things that actually make you happy? 7. Fueling your body with nourishing food. Introverts are highly sensitive (it’s estimated that about 70 percent of introverts are also considered to be highly sensitive people) and this also extends to food, meaning that what we choose to fuel our bodies with has a significant impact on our energy, mood and overall well-being. All foods are essentially energy, and when we choose to fuel our bodies with the good-stuff, we raise our vibration to be aligned with radiant and abundant energy. Start being intentional about choosing whole foods with high nutrient levels and avoid calorie laden and processed foods. This will have an enormous impact on your health, energy levels and overall well-being - something you will notice the effects of almost immediately! Every morning I start my day with this delicious, nutrient dense and energizing smoothie - it keeps me full until lunch and not only is it packed with a ton of nutrients, it also tastes amazing! Add all ingredients to your blender and voila - a delicious and super simple breakfast! So beauty, I’d love to know - which of these daily rituals do you think could support you feeling calm, grounded and more balanced?